10 ml and 100 ml amber glass bottles. Nonredundant product for treatment and prevention of cardiovascular and cardiopulmonary diseases. Effectively reduces age-related changes by protecting cells from free radicals. Significantly increases quality of life of aged animals inspiriting them. Notably reduces rehabilitation period and animal treatment costs in various diseases. Reliable prevention and correction of metabolic disorders in intensive therapy and stress. 1 ml of Emidonol 5% solution for injections contains eminodol® substance - 50 mg (as an active ingredient) and excipients. Appearance: colourless or light yellow clear odourless liquid. Emidonol 5% is antioxydant drug (free radical inhibitor). The drug has frank antioxydant, antihypoxant and membrane-protective properties providing therapeutic and preventive effect in various hypoxias. Mechanism of action involves specific influence over energy metabolism by reducing lipid peroxidation in cellular membranes and free radical binding leading to increase in cellular energy level in conditions of oxygen defect. After parenteral administration eminodol® rapidly absorbs in injection site and distributes in organs and tissues. After hepatic biotransformation it is mainly excreted in urine as pharmacologically inactive metabolites (glucurone conjugates) and unchanged drug in trace amount. According to severity of exposure, Emidonol 5% is a marginally hazardous substance (12.1.007-76 All Union State standard Hazard Category 4) and does not provide any local irritative, cumulative, embryotoxic and teratogenic properties. Use for prevention and as a part of combined therapy of diseases associated with hypoxia (oxygen defect) of organs and tissues including acute and chronic cardiovascular and cardiopulmonary impairments, diseases associated with inflammatory processes, traumatic pathologies (wounds, dermatitis, eczemas, trophic ulcers, ambustions, freezing injuries), stresses and various intoxications; during rehabilitation period after diseases and surgeries; after general anesthesia and in veterinary geriatrics. Use the drug for treatment and prevention of internal ishemic affections associated with hypoxia in sport animals (dogs). 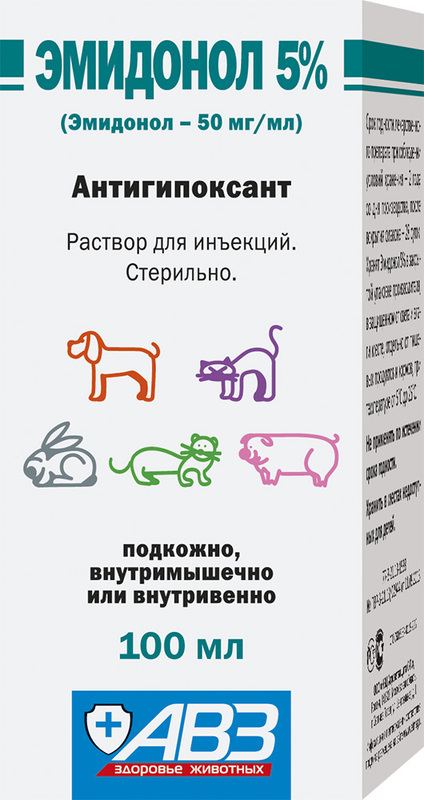 Use Emidonol 5% solution for injections for treatment and prevention (as a part of combined therapy) of pathological conditions associated with hypoxia (oxygen defect) of organs and tissues in dogs, cats, rabbits, fur animals and ornamental rodents. Treatment and prevention: administered subcutaneously, intramusculary or intravenously (by drop infusion, 60 drops/min) in listed doses. Administration frequency is 1-2 times a day within 5-15 days. An attending veterinarian prescribes treatment course and drug administration frequency depending on physiological status and course of disease. Veterinary geriatrics (dogs and cats above 7 years old): administer 0.5 ml of 5% solution for injections per 10 kg of body weight (2.5 mg of active ingredient per 1 kg of body weight) once a day within 10-30 days during vernal-autumnal period. Adverse events and complications generally are not observed in case of Emidonol 5% administration as per package insert. In case of increased individual sensitivity to the drug components and allergic reactions, stop administration and use antihistaminic and symptomatic drugs. Overdose symptoms are not detected in animals. Emidonol 5% is compatible with other etiotropic, pathogenetic and symptomatic drugs. Store Emidonol 5% in closed original package. Protect from light and moisture. Store separately from food and animal feeding at 5-25°С. Keep out of the reach of children. Drug shelf life is 2 years from manufacturing date when stored in accordance with regulations. After the first opening the drug remains active within 28 days when aseptic and antiseptic conditions are kept.